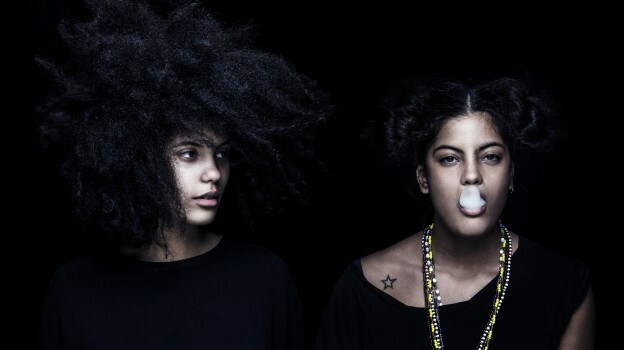 Franco-Cuban twins Lisa-Kaindé and Naomi Diaz comprise Ibeyi. They’ve built a 2014 EP and now this self-titled LP debut with piano, traditional Cuban percussion, English poems of wildly variant efficiency, and Yoruban (a Nigerian language) chants. All these instruments are too defeated for hip-hop, but too indignant for jazz. Hence, they deftly choose to forge a fusion between the two genres, part of a broader spiritual and musical mending that’s compromised here over thirteen tracks. The constant in Ibeyi’s universe: loss, and the ensuing yearning for people and ideas that aren’t present for them; whether because of death, health, unwillingness, or not being of this world entirely. This is a dialogue with themselves, the earth-bound humans, and the sky-bound entities they need to expel their grief. We begin by hearing the twins’ personal talk with Eleggua, the Yoruban orisha tasked with linking the spiritual world with the physical one. The song is simple, like an easy morning with too much unassigned time and space. Ibeyi dedicates the next three tracks to mending a tarnished relationship. Their appeals are scarred with harsh, loud, strong, unwelcome drums. Each song ends with pleas in tongues foreign to the vast majority of those crude enough to overhear. Ibeyi backs up their plea with two simple, repeated, poetic verses detailing their troubles of the soul and hidden, personal demons. As they testify, they falter and hesitate. They deploy gentle, whimpering piano as witness, crippled here to only play the most simple chords. It’s the most they can muster while facing the scorn of an angry deity. Their decision is made clear in the album’s remainder. No spirits for the protagonists; they take their concerns to earth-bound creatures they can see and touch and obtain satisfaction from and maybe even enjoy the company of. Tracks are now flooded with lyrics not often repeated. Instrumental complexity aligns evenly with that of increasing lyrical – now a second constant for Ibeyi as they’re freed of divine rules and control of their lives. This entry was posted in Reviews and tagged ibeyi on March 16, 2015 by admin.